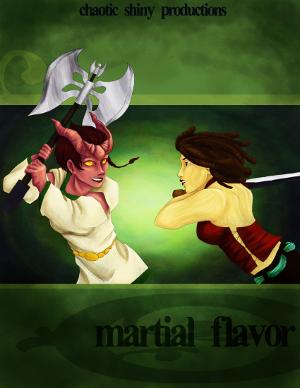 Martial Flavor: Just where did you come from? So just where did you come from, anyway? Were you an orphan, sent out in the world on your own when [tragedy] happened to [beloved relative]? 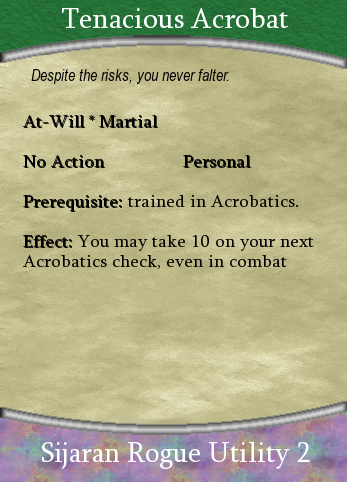 Did you learn [ancient fighting style] from [secretive order]? Were you a [menial laborer] who first picked up a blade in order to [grandiose verb phrase]? Or are you a charming and sly Sijara, wandering the world eternally as all your people have been blessed to do? A wise Ikanoi warrior who triumphed over the arctic wastes before earning the right to call herself a fighter? Or could it be possible that you were once a ruthless, deadly member of the Daikort Pack, sworn to pledge your blade at your comrades' call forever more? Introducing Martial Flavor: Five unique martially-themed subcultures for your 4e D&D game, with over 50 pages of background and the feats, class features and utility powers to back them up. Don't like the book? We'll refund your money, no questions asked. What can Martial Flavor do for you? If you're a player, it can give you a unique background that makes a difference at the table, without you having to go through the trouble of coming up with one yourself. You get some great ideas for your character's past, present, and future, and your GM gets a few hooks to use for your benefit. Plus, your background feats and powers let you show off what makes you who you are in more than just roleplaying encounters. If you're a GM, it gives you cultures you can drag and drop into your game world, be it published or homebrewed. You get example NPCs from each culture that you can put right into your campaign, and tons of culture-related hooks for crafting sidequests or even entire adventure arcs. Your NPCs have diverse values and just enough unique feats and powers to keep your players guessing. Terror Tables - a random ge- what made that sound? Guys? ..Guys? Martial Flavor comes with power cards for each of the 36 new utility powers presented in the books, plus blanks for each culture so you can make your own. Here's what they look like. At the beginning of time, there were no free people and bound people; only people. Then the eldest god wandered to all the peoples that were, and one by one asked them for a seat by their fire. Each people gave him a place of honor. The next day, he asked his hosts what trade they would learn from him, and each one in turn had a request. He taught every people their chosen trade, and through that bound them to their place in the world. That is how there came to be many different bound peoples, with many different trades. When he came among the free people, they too gave him a place of honor by their fire. But when he asked them what trade they would learn, they replied that they would take no payment for their hospitality. Because they would not accept his teaching, he could not bind them to a place in the world, and so they were the only people free to wander the world as they pleased. But because they did not learn a trade, they must instead borrow and steal those of others. That is how the free people came to be as they are, and that is how they remain to this day. The Sijara are nomads by nature, as at home on river ferries or in caravans through the desert as they are skulking city streets or touring villages. They view all outsiders  the bound people  as at best, fools, and at worst, cursed. Because of their inferior status, they are to be pitied, but also to be taken advantage of. It was their own gullibility that bound them to the world, and there is no shame in the Sijara making a profit off of it. Not all Sijara are thieves and con artists; many prefer to trade fairly with those they encounter. These often make a good living as respectable merchants, transporting goods from one exotic locale to the next as they continue their endless wandering. What all Sijara share in common are their wanderlust and their silver tongues. Sijara usually travel in family groups, ranging anywhere from small troupes of three or four to huge extended families with members numbering in the dozens. After coming of age, most Sijara strike out on their own to make their fortune, traveling alone or with other families for a few years before finding a lifemate with whom to raise a family of their own. Because of this tradition, many Sijara spend at least some time adventuring. Sijara background benefits: You add Bluff and Diplomacy to your class skill list, and gain a +1 bonus to Bluff and Diplomacy checks. Cobalt, a warlord, grew up sailing across the seas, never staying longer than a few weeks in any one port. He once dreamed of captaining a ship of his own, but after a few near-shipwrecks too many, he decided that his future travels would be confined to land. Ill-equipped to deal with the dusty world of streets and cities on his own, he now seeks companions to journey with. Hes willing to go anywhere, so long as theres solid earth beneath his feet. Resh, a rogue, tries to breathe as little fresh air as he possibly can. Cities are where he belongs, whether underfoot as a simple pickpocket, or running across the roofs after a major heist. Cut loose from his close-knit family, he seeks to build a new family of his own: one where he keeps the majority of each take. All he needs is a band of toughs to protect him through the hated roads and forests until he can find just the right city in which to start. All feats in this category have Prerequisite: Sijaran Background in addition to any other prerequisites they might also have. 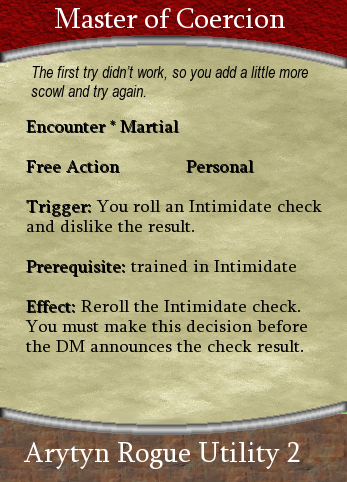 Benefit: When you fail a Bluff or Diplomacy check and do not reroll it, you gain a +3 bonus to your next skill check. Benefit: You may use the Bluff skill in place of an Insight check to determine truthfulness. Benefit: Gain a +2 bonus to the speed of any vehicle you pilot, and increase its overland speed by the corresponding amount. Download the whole Sijara martial background free! The Daikort Pack is a lethal cabal of skilled warriors, trained to live, track, and fight in any climate. Their base never stays in the same place for long, nor does their allegiance. They will use any skill to get the job done, and are rumored to teach their recruits a few tricks that go beyond mere martial training. Ruthless mercenaries, the Daikort take either the best of the best, or the worst of the worst, depending on who you believe. They recruit warriors just starting out, teaching them their specialized methods, and requiring from them a certain amount of service before they are free to leave. Daikort members are not free to choose among missions. They go where they are assigned, do the job, and are paid their wage. However, each member accrues some amount of Favor for every mission. Favor is how the Daikort measure non-monetary debt, and they take it even more seriously than gold. Considering how deadly serious the Daikort are about payment, few members ever leave carrying a significant balance of Favor debt. Here are ten missions that members of the Daikort Pack have completed in the past five years. 1. Slay a family of red dragons that made their home in the heart of a volcano. 2. Track down a band of rebels led by the exiled younger son of an important lord, and bring the ringleaders to justice. 3. Steal the bones of slain warriors from graves across the land for a necromancer. 4. Gather samples of the scales of aberrant reptiles infesting a swamp. 5. Rescue a band of missionaries caught between three warring jungle tribes. 6. Assassinate the priest leading a breakaway sect that was gaining political influence at a rapid pace. 7. Free an isolated mountain village from a tyrannical frost giant. 8. Sabotage an arcane experiment at a college of mages. 9. Negotiate with a tribe of merfolk that were interfering with important shipping routes. 10. Hold a mountain pass against an invading army until the defending army could arrive. It wasnt always this way. We had a home once, far from here. Some say it was in mountains, and some, in desert. I have never laid eyes on either. Some even say that we had towering cities once, and a way of writing like the other peoples have. I do not believe this is true. Such thinking leads to weeping over a lost past, instead of looking toward our future. I know that to you, the future stretches out unbroken like the unchanging plains. Seasons come and turn the color of the grasses, but all else is the same. But you are young. You will see that it is not so. There is room for glory in the world. See how my herds pasture stretches to the horizon? It wasnt always this way. Hard work made it so. I built all this by trading, but I see the fire of a raider in your eyes. So go, take a horse, and win your fortune with the bow and curved sword. Just know that there is more to life than trading, raiding, and dying. Look to your future, but never forget that it wasnt always this way. Maloc, a ranger, would rather build his fortune breeding horses than taking them by force. But he is not content to breed ordinary horses, settling for mounts that are merely faster or stronger than those of his neighbors. He has heard of far off places where horses of legend dwell: celestial chargers, nightmares, and even unicorns. To find and bring back a magical stallion or mare, and begin a line of supernaturally empowered horses would make him the wealthiest breeder on the plains. Leaving his herds in the care of his son, he is prepared to ride to the end of the earth in pursuit of his dream. Sarai, a fighter, has never quite had control of her temper. When her brother was slain in a raid, she avenged him with an attack on the kin of his killers. But such blood feuds are not part of the tradition of her people, and so she took to the road, fleeing her guilt and shame. She is not sure whether anyone hunts her, but either way, she can never return to the plains. Now she will have to find a new use for her horsemanship and combat prowess, or starve. Yakov, a fighter, was known far and wide as a fierce raider. Since the time he was old enough to hold a blade hed been going out on horse raids, first alongside his older brothers, then on his own. His herds quickly grew much larger than those of the surrounding breeders, and that was the problem. Yakov would much rather be fighting than doing all the day-to-day work involved in taking care of large amounts of horses. A passing group of adventurers inspired him, and he quickly bartered off most of his herd, trading them for enchanted weapons, armor, and a map. Equipped for adventure, Yakov isnt sure what awaits him beyond the wide plains, but he does know that whatever it is, hes ready for it. Mounted knights in armor have nothing on the fighters of the Elessim. Nimble, quick, and very nearly one with their horses, Elessin fighters ride in light armor and wield curved blades more often than lances. While they are formidable fighters on their own two feet, very few will ever go into battle without a horse. Elessin fighters may replace their Fighter Weapon Talent class feature with Fighter Horse Talent. Fighter Horse Talent: You gain a +1 bonus to attack rolls when mounted. The ultimate in mobile cavalry, Elessin rangers charge up to the fringes of battle, let loose a storm of bolts, then wheel away again on their swift-footed mounts. Experts at mounted archery, it is said that it is an open question as to which is faster: an Elessin rangers horse, or his arrows. Elessin rangers may choose the Raider Fighting Style. Raider Fighting Style: Because of your riding experience, you gain Mounted Combat as a bonus feat. Ikanoi are covered with tattoos from head to foot, with each portion symbolizing a different part of their story. However, they rarely display any of these sacred markings. Growing up dressed to accommodate arctic weather, they still do their utmost to cover up even in tropical climates. Revealing any tattoos but those on the head, neck, hands and feet is a mark of overwhelming trust. Each Ikanoi sports near-identical chest tattoos, given as soon as they are old enough to bear them. These markings tell the story of the tribe, from its inception to its present day. Younger Ikanoi will have slightly more compressed versions of the markings near the center  the tribes early history  to leave room on the edges for the tribes recent history. This covers great battles, migrations, shifts in tradition, and other things important to the tribe. No individuals are represented in this history. One portion of the pattern will never change in style or size: the area over each Ikanos heart, which tells of the founding of the tribe. The tattoos on an Ikanos back are the legend of their own personal ancestor, in whose path they follow. These do not vary at all between Ikanoi who share the same guiding ancestor; they are the original story, which does not change over time. Because of this, these markings are more clear than many of the others, which have been shortened and modified as the stories grow. With this tattoo, each Ikanos carries with them an unchanging guide on how to best live up to their ideal. While Ikanoi are egalitarian, their tribe is divided up based on each members guiding ancestor. This division is sometimes seen by outsiders as one of social rank, but to the Ikanoi, nothing could be farther from the truth. Some of them are more skilled at leading or fighting, while others talents run in the opposite direction, but all are vital to the survival of the tribe. These are the eight guiding ancestors that are most likely to be associated with adventurers. A guiding ancestor does not have to be the same gender as their descendant; only their nature matters. Arikrates: A mighty warrior, Arikrates slew the leader of the winds with his great sword. He was always at the center of the battle, dealing grievous wounds with his massive blade. Arikrates is the patron of powerful warriors, blessing them with might and everlasting stamina. His icon is a sword with fangs on either side. Artama: The greatest hunter of the tribe, Artama showered arrows down among the winds. She darted around the edges of the battle, sometimes striking from nearby, other times, from afar. She blesses hunters and scouts with the agility to avoid their enemies attacks and the might to land devastating strikes of their own. Her icon is a pair of crossed arrows. All feats in this category have Prerequisite: Ikanikon Background in addition to any other prerequisites they might also have. Benefit: Once per encounter, you may add your History skill bonus to a Charisma-based skill check. Benefit: Once per encounter, when you are about to lose concealment, you may make a moderate difficulty History check. If you succeed, you remain concealed. Benefit: Once per encounter, when you are hit by an attack, you may make a moderate difficulty History check as an instant interrupt. If the check succeeds, add your Wisdom modifier to all of your defenses until the end of the round. 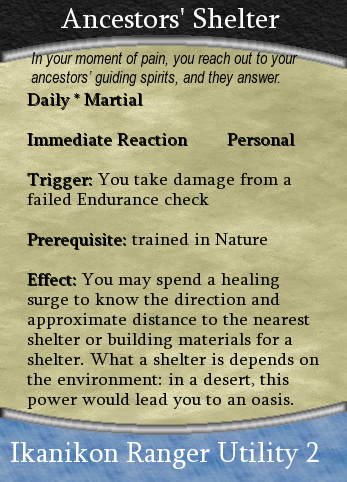 Martial Flavor came from my desire to give people something they could use to define their character that wasn't huge and sprawling like entire game worlds or nations. The cultures in Martial Flavor are more like subcultures. They can easily fit among other cultures, and you don't have to portion off an entire part of the map of your gameworld with the legend "here be Sijara." I try to explain it to people as, "Don't think, 'USA,' think 'motorcycle gang.'" While some of the cultures are more expansive than others - the Elessim, for instance, could take up an entire region if you wanted them to, while the Daikort don't exactly have a territory - I think that overall, I succeeded in my goal. The Legions of Arytis were the idea that sparked the book, though they were a lot different at the start. Originally, they were a secret society of fighters dedicated to guarding the sacred places within a certain city. While they're still very much the elite, a lot of that mystique ended up with the Daikort instead. The Sijara were the first culture that I actually wrote up. I wanted to take the traditional 'nomadic cultures are cursed to be eternally rootless' trope and turn it on its head. Everything else about the Sijara flowed from that. I also liked the idea of using the different cultures to emphasize different aspects of the classes. Sijaran rogues are silver-tongued charmers, while Arytyn rogues would sooner gut you than talk to you. Each culture has two stats that it emphasizes, though this comes through more in some than in others. For the Sijara, it's Dex and Cha. For the Ikanoi, it's Con and Wis. For the Elessim, it's Dex and Str. The Legions of Arytis highlight Str and Int, though the latter is less obvious, and the Daikort are even less clear-cut. The Daikort are actually the last culture I came up with - the book was written very nearly in reverse. I had this idea of a group of all-terrain mercenaries, and somehow the idea of elemental magic got mixed up with it.